Canvas Preparation that gives you a smooth finish. Canvas Preparation that eliminates the pesky weave in the texture of the material. Canvas preparation isn't really that hard. Follow these steps in preparing your canvas or priming the canvas with a prepared priming product. You will need Modeling Paste and Gesso. Why do we need to prime the canvas again rather than using an already primed canvas straight away is this. These canvas’s are way too rough, even though they are primed once or twice already. 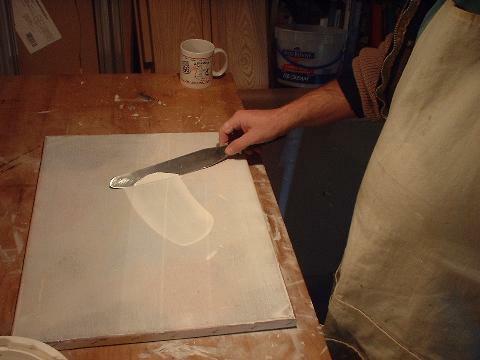 This additional canvas preparation gives you the smooth texture, (similar to an egg shell finish) that helps throughout your entire process of painting in this technique. It will help with your pencil and ink drawings, all the way through and in the final layer, where very small minute brush strokes are used. Canvas Preparation, what you'll need! 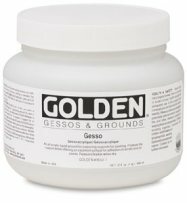 Why Modeling Paste? The modeling paste gives the gesso body. It is an acrylic product. Never put acrylic over oils. 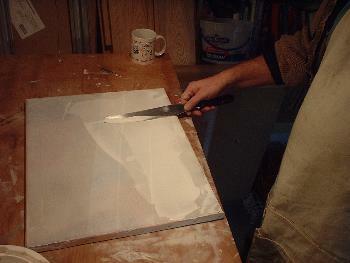 With the gesso having the additional body, it is easier to spread and smooth out. It also is easier to remove imperfections. Using straight gesso, (which usually contains some marble dust but is very plastic like) makes it very, very difficult to sand and/or smooth out. 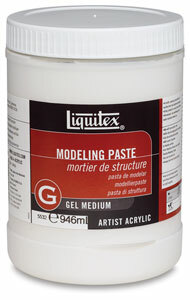 And the modeling paste mentioned earlier. 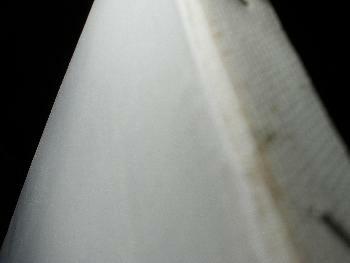 In my eBook, I mention the use of a single edged razor blade with its corners ground off off by grinding. 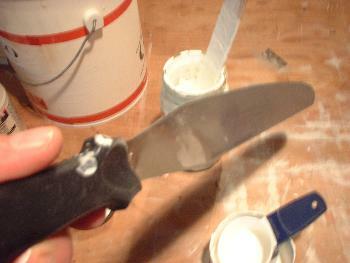 This can speed things up, but if you don't grind, the razor will gouge out deep cuts in the gesso/modeling paste layer. The rounded razor removes only the high spots! If you can't grind a razor down, just use sand paper. You will get satisfactory results. About 120 - 400 grit should do it. Anything larger (80 grit) leaves gouges, any thing finer, (600 to 800 grit) will take you forever, but judge by how much material is removed. You just want the high spots gone. The next tool is a confectionery knife. It too has had it's blade rounded off on by grinding or filing! Below, you can see the texture of a primed store bought canvas. This usually has one to two coats of acrylic gesso already applied. 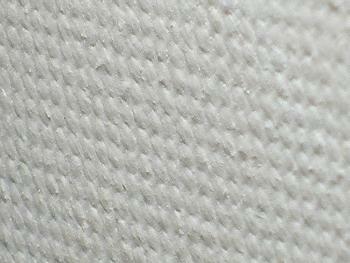 As you can see, the texture is still very bumpy with the weave of the canvas very visible. Your canvas preparation will make this disappear! It usually takes 2 to 3 coats. If you use fine linen rather than canvas, you will have less steps. I have never needed more than 2 coats to get a perfectly smooth surface. Sometimes you can find linen priced the same as the canvas! And linen is the better product, so you can charge more for your painting. Applying the gesso mixture is pretty straight forward, you can pour it from the jar, or dabble a few globs with the stirring stick. I prefer the later so I have a little more control of the amount. Spread the mixture like buttering bread. The larger the canvas, the more difficult canvas preparation becomes. Start on a small 9" X 12" canvas for your first attempt at this. the canvas to start the next side. Using a hair dryer, I blow dry the canvas to speed up the time to complete. Once the layer is dry, you are now ready to smooth out this 1st coat. It takes 2 steps. 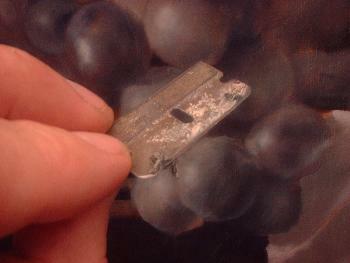 The first is with the razor concentrating on the high spots or ridges created by the knife. (These will appear as fine lines unless you hold the canvas vertical against a light to see the actual risen edge). The second step is to sand the minor imperfections left over. Remember, the egg shell smoothness is your goal. Use strokes holding the razor at 90 degrees, (straight up and down) against the canvas. It is a scrapping motion, not a shaving motion you are going for. You should have very fine peelings of gesso/modeling paste coming off as you perform this. It is created from the high spots being scrapped off the surface. Finishing up with some sandpaper to get the smoothest finish always helps shorten the process. I use about a 120 grit paper. Holding the canvas against a light vertically will amplify your view of the surface imperfections. Repeat this process 2 more times, 3 if necessary, to get your egg shell finish for the perfect canvas preparation! When you've done those extra coats, place the canvas vertical and close to a light source. You are looking for any raised edges. These need to be feathered out with the razor or the sand paper. Normally at this stage (3rd coat) the canvas is absolutely white, and smooth! Now we begin the drawing stage! (if you've decided on a subject and are ready!) Or maybe you need to refresh yourself on composition! Either way, the links will direct you! If in doubt of whether you should put all this work into canvas preparation? Again, if you have access, take a close look at the masters paintings. Do you see any canvas weave or texture (tooth)? Most likely you will only see a smooth surface except for the raised final layer of yellow/white paint! But before you click away, I've received emails of folks having problems stretching their factory prepared canvas's, so let me explain a little deeper. It is a problem with canvas's that I see where I buy in bulk, so this I think will help you. It's an expanded version and a video on how to prepare the canvas. So click below and get some more insight! Expanded version of canvas preparation, stretching canvas the right way. Do you need a bit more examples or need to see the process from start to finish. My e-book "A Real Art Lesson" has a chapter just on this with over 2 dozen photos and a more detailed explanation on the use of the razor, sand paper, and confectionery knife. 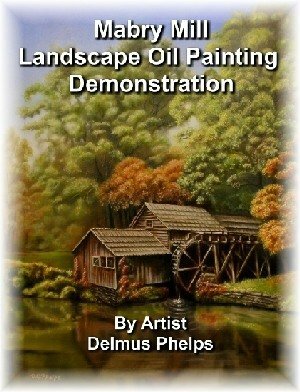 A Real Art Lesson downloadable eBook, instant access!